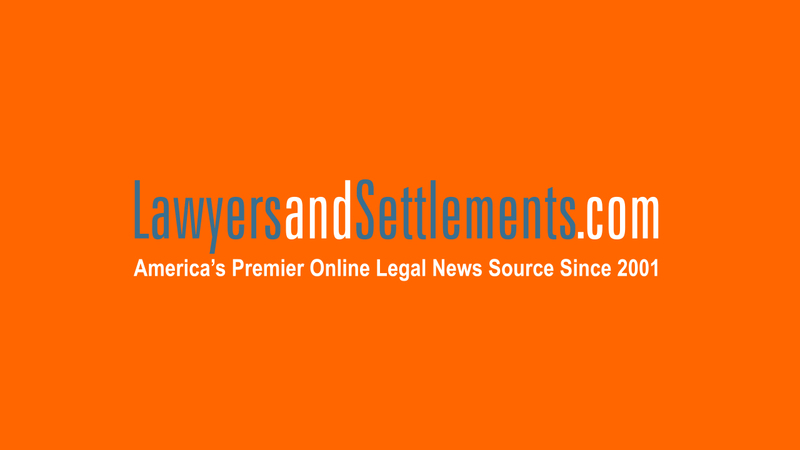 Were you looking for Asbestos Drilling Mud lawsuits? Asbestos mesothelioma is a fatal asbestos cancer involving the mesothelium, a protective lining that encloses most of the body's internal organs. The only known cause of mesothelioma seems to be exposure to asbestos particles in the air. The time between exposure and the appearance of symptoms can be as long as 20 to 50 years. 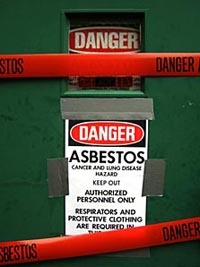 Send your Asbestos Mesothelioma claim to a lawyer who will review your claim at NO COST or obligation. Exposure to asbestos fibers has been linked to asbestos cancer, asbestosis (scarring of the lungs that restricts breathing), asbestos mesothelioma (cancer of the lining of the chest cavity), and silicosis. The chances of getting an asbestos-related illness increase as the level and duration of exposure to asbestos increases. 1. Get a clear diagnosis which ideally includes a tissue biopsy; or get a copy of the medical records and diagnostic documents from your loved one' physicians. 2. Prepare a will. If you, yourself, are a victim of asbestos mesothelioma, it' best to prepare a will that stipulates which law firm is to represent your case. While no one likes to think of these things, the executor of your will may ultimately need to work with this law firm. Better to identify your law firm rather than risk having multiple lawyers getting involved in the case as a result of various family members seeking to find counsel on your behalf. 3. Write down when and where you believe you or your loved one was exposed to asbestos. 4. Write down the name of the company or companies you or your loved one worked for, even if you or your loved one worked as a contractor. 5. Write down the names of fellow workers that knew there may have been asbestos on the job site(s). 6. Contact an asbestos mesothelioma lawyer. If you have not already done so, you should meet with an asbestos lawyer and bring all supporting documentation with you. 7. Have the lawyer prepare an affidavit of critical facts for preserving your case. If you have been diagnosed with asbestos disease, there' a good chance that your colleagues will also have been exposed. They may even have contacted a lawyer already, and be familiar with the process. If possible, reach out to your former colleagues to find out how they are and what, if anything they may have done or be doing, and if they will support you in your claim. If you are a spouse of a mesothelioma victim who has recently died from the illness, you and your heirs could have between one to three years from the date of death to file a wrongful death action, which may result in the recovery of substantial monetary damages. Asbestos is not banned in the US and Canada and it is still in use in a wide variety of products. The Environmental Protection Agency (EPA) estimates that there are 3,000 different types of commercial products currently in use in the US today that contain asbestos, including building materials, brake pads, and fire retardant materials and products. Exposure can also come from unlikely sources. A weekend do-it-yourselfer may become exposed while undertaking home repair projects around the house. Asbestos fibers can also be transferred via clothing, skin or hair through contact with a household member who has worked around the deadly substance. People who suspect that they or someone they love might have been exposed to asbestos should always get a clear diagnosis to determine the severity of their illness. Asbestos can pose a serious health threat when disturbed or when it begins to deteriorate and asbestos fibers are released into the air and inhaled. To date, companies which have exposed their employees to asbestos have faced thousands of lawsuits and settled hundreds of millions in damages. Asbestos is mainly used as an insulating material – it is a very effective fire retardant material, hence its use to insulate boilers, pipes, and fire doors; it's used in roofing and many construction materials, and in electrical fittings. The types of work environments where you are most likely to encounter asbestos include mines, shipyards, railroads, power plants, and construction sites. Asbestos mesothelioma doesn't just affect the people working with it directly. Recently the medical profession has started to recognize that people can be affected by asbestos-caused diseases through secondary or passive exposure. For example, cases of second-hand asbestos exposure were recently been reported by wives and children of men who worked in the shipyards in World War II. The workers were exposed to large amounts of damaged or "friable" asbestos while on the job, and their wives became came ill following exposure to asbestos fibers that had become lodged in the workers' clothing. Over the years, the constant inhalation of these fibers resulted in the development of asbestos-related diseases. Secondary asbestos exposure is also possible by living in a community or area located near an asbestos mine or a company that manufactures asbestos or products containing asbestos. Many older buildings may also contain asbestos insulation, including schools. Perhaps the most famous victims of community contamination in North America are the residents of Libby, Montana, an asbestos-mining town. Vermiculite, which naturally contains asbestos, was mined there between 1923 and 1991. Workers and families of workers who lived in the town sued W.R. Grace, the last company to own the mine. At one point the company reportedly faced 110,000 lawsuits for sickening hundreds of people and contributing to the deaths of 225—allegedly with full knowledge. Other examples of community exposure include the World Trade Center site after the terrorist attacks of September 11, 2001, and areas prone to damage from natural disasters like Hurricane Katrina. Early symptoms of asbestos mesothelioma can include chest pain, fatigue, shortness of breath, hoarseness, cough, fluid retention and abdominal swelling. Because mesothelioma affects the pleura, or the membranes that surround almost all of your internal organs, pain or swelling in the chest or the abdomen could be a symptom of mesothelioma. You are warned to contact your doctor if you experience any of these symptoms. If you have been exposed to asbestos fibers in the past you should make your doctor aware of that as well. For decades, thousands and thousands of workers were unaware of asbestos-related diseases and were not given respirators. Workers in the asbestos industry would have to be made aware of harmful asbestos exposure if they were given safety and protective gear, i.e., asbestos respirators. In many cases, the employer knew about asbestos exposure but failed to warn of the hazards, including asbestosis and mesothelioma. For example, a forklift driver who worked with asbestos was never issued a respirator. In another case, a drilling rig worker was constantly exposed to asbestos drilling mud without any safety gear except for a handkerchief. "Failure to warn"is a main contention of litigation against the asbestos industry. Other lawsuits pertain to defective respiratory protection. Countless lives could have been saved if asbestos respirators actually protected workers from breathing asbestos fibers. Some asbestos lawsuits have shown that employers failed to warn for economic reasons, such as the cost of asbestos respirators. Currently, defendants in asbestos litigation include manufacturers whose products contain no asbestos and did not affect a plaintiff' exposure to asbestos, such as 3M Company. For more than two decades the 3M Company has been the target of about 400,000 lawsuits over its dust mask, which was used as an asbestos respirator, alleging the product is defective. Other respirator manufacturers have also been accused of marketing defective masks, even though they were approved by the National Institute for Occupational Safety and Health (NIOSH). American Optical has been named in more than140,000 lawsuits claiming their defective asbestos respirators contributed to, or were responsible for, asbestos-related diseases on workers who were unaware that they wore faulty protective masks. Faulty equipment and/or not even given asbestos respirators are still an issue. In 2007, Maryland state officials ordered a 'halt to work' when a contractor licensed in asbestos removal had exposed up to 20 workers to asbestos without any protective gear. A Worker' Compensation Report in May 2009 found that firefighters may not be completely protected from hazardous substances such as asbestos due to inadequate protective equipment. Asbestosis is a chronic inflammatory lung disease that is caused only by inhaling asbestos fibers. Although it is not a type of cancer, asbestosis is a serious and life-threatening disease because it can lead to asbestos lung cancer and mesothelioma. The chances of getting asbestosis increase as the level and duration of exposure to asbestos increases, and anyone who has come in contact with asbestos is at risk for developing asbestosis. Symptoms of asbestosis rarely occur less than 10 years following first exposure to asbestos fibers and are more common after 20 years or more, therefore making it even more difficult to file a lawsuit by yourself. Many reports have proven that corporations, asbestos makers and industry members had knowledge of the dangers of asbestos and its link to asbestos-related illnesses since the 1930s. An asbestosis lawyer can bring about a suit against multiple asbestos employers and asbestos manufacturers. 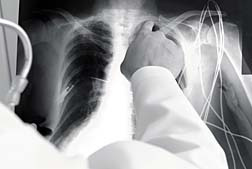 If you or a loved one is suffering from lung cancer, asbestosis, mesothelioma or other asbestos-related diseases caused by exposure to asbestos or asbestos containing products, you may qualify for damages or remedies that may be awarded in a possible class action lawsuit. Please click the link below to submit your complaint to an asbestos lawyer for a free case evaluation with no obligation. Asbestos Drilling Mud alleging injuries from asbestos exposure to oil workers from drilling mud. Los Angeles, CA: After reviewing documents and testimony from 1971 to the early 2000s, a new report by Reuters determined that Johnson & Johnson’s executives, mine managers, doctors and lawyers were aware the company's raw talc and finished powders sometimes tested positive for small amounts of asbestos. This report reflects many Johnson & Johnson lawsuits alleging these talcum powder products caused women to get ovarian cancer, mesothelioma and other cancers. Will the New Asbestos Regulation Put the Publ..
Asbestos Mesothelioma Passed from Father to S..
New Evidence Reopens Scotts Turf Builder Meso..
My father passed away from lung cancer and he was a miner most of his life. I was relocated from a housing project to another because of absestos and mold exposure at high levels. My four children and two grandchildren also lived with me...along with 90-plus other families. I just recently was diagnosed with COPD. My mother died from multiple myeloma. She worked in an asbestos-laden building. Esophageal cancer which spread to lungs. Mesothelioma/Pleural Effusion/asbestos exposure: Volume of fluid increases, shortness of breath, known as "dyspnea", and sometimes pain, ranging from mild to stabbing. A subtle area of ground-glass opacity in the right upper lobe. Some fine increased interstitial markings in the periphery of the posterior aspects of the lower lobes, with some bronchiectasis and small focal areas of pleural thickening. Findings are nonspecific, but are suggestive of asbestosis. He had cancer of the larynx and of course plureal plaque in his lungs. His doctor referred to asbestosis also. I have medical bills, and need further medical follow-up. My health has suffered, which greatly impacts my life; and the psychological/emotional damages of an early and terrible death are beyond cost. In 1999,I, three generations of my family and a entire town learned the truth as to why we are sick and dying.From not being told the truth.The latency period for this poison became too much to hide,cover up,etc. And since 1999, I have continued to save people by telling all who will listen to stay away from Libby Montana as Libby is not safe to anything that breathes. Tremolite asbestos kills you,period...Look up Libby Mike Crill on yahoo/google and see what I have been doing for the last 9 years....Saving people/families from the same thing that is killing me.Where is Govt.???? I have ashma and shorness of breath and unexplained chest paine and bouts of plursia. I worked for a paint store that sold abestos floor tile and handled thousands of boxes of tile over the years. The boxes were often covered in a powdery whitish dust and my hands were often coved in such dust. I and an another employee drum sanded approximately 8500 sq ft of old asbetos floor tile to remove the glaze for installation of new floor tile. This process raised clouds of dust which we breathed unproted by masks. This process took several days. This was in the fall of 1972. Un fortunately we did not realize that this was dangerous to our health.